By using lasers to simulate the impact of a large meteor with primordial Earth, researchers have shown how the atom bomb-like collisions might have reconstituted ordinary molecules into the early building blocks of life. The new experiment doesn't prove that life got started in this way, but it does bolster the long-held theory that life emerged in the wake of cataclysmic impacts during the Late Bombardment Period. And indeed, some the earliest precursors to life on Earth emerged at this time when the Solar System's asteroid belt was bigger and stray objects hit our planet with great regularity. The feigned cataclysm took place in a lab in Prague, Czech Republic, using a 492-foot laser system to create a high-density plasma, with temperatures soaring to about 7,640 degrees Fahrenheit, and see its effects on a pool of formamide. That chemical, commonly used in making sulfa drugs, has been identified in the tail of comets and around young stars, and some researchers believe it could have been present on the early Earth nearly 4 billion years ago. [...] "If you want to solve a problem of DNA and RNA, first you have to explain where the bases are coming from," said chemist Svatopluk Civis of the Czech Academy of Sciences, lead investigator of the study. "What we wanted to simulate was the impact of an extraterrestrial body into the early stage of the atmosphere." This experiment follows in the tradition of trying to transform simple organic molecules into amino acids, whether it be mimicking the energy provided by lightning, hydrothermal energy, ultraviolet radiation, nuclear decay, or in this case, a collision with an astronomical object. ...John Sutherland of the MRC Laboratory of Molecular Biology in Cambridge, England, said the amount produced of one base was so small that the results don't seem relevant. Other researchers also downplayed the work. An alternative theory of early life on Earth says that microbes arrived here from space aboard a comet or an asteroid — a sort of seed theory of life. Civis' work bolsters what would instead be a fire theory of life. It is a theory of both creation and destruction. For this whole chemical reaction to work, the extreme energy from the asteroid collision would have had to break down molecules into less-complex chemicals, which then could re-form into the more vital combinations. 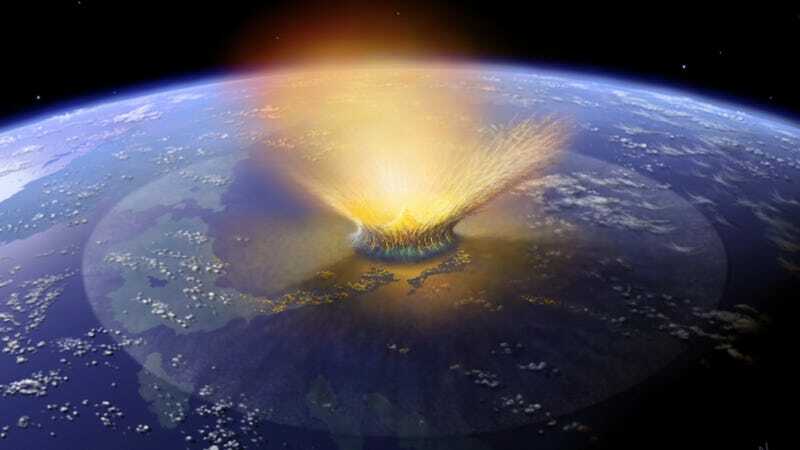 The type of asteroid impact that might have sparked this process also snuffed out the dinosaurs billions of years later, Nesvorny said. Clearly, more work needs to be done on what is turning out to be one of the most challenging problems to ever face scientists. Find out more about this experiment at the LA Times and The Big Story. And check out the study at PNAS: "High-energy chemistry of formamide: A unified mechanism of nucleobase formation".